Acute or chronic bleeding of the oral tissues directly under, or adjacent to, a fixed or removable dental prosthesis. Question the patient about their medical and dental history. How long have you noticed bleeding and/or discomfort? Where is the bleeding coming from? Please show me with your finger. Is there a time when the bleeding is worse (e.g., when eating or waking up in the morning)? Do you wear the prosthesis at night? How old is the prosthesis? How do you clean the prosthesis? How do you clean your teeth? 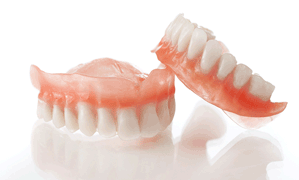 When was the last time you had a dental professional check the prosthesis? Did you have a denturist or someone else adjust it for you? Did you adjust it yourself? Has your medication changed? Has your medical history changed? When you cut yourself, does it take a long time for the bleeding to stop? Do you bruise easily? Is there any numbness in your mouth or face? Have you noticed any white or red spots in your mouth? Any areas of roughness that do not go away? Evaluate the patient’s mouth and prosthesis. Before removing the prosthesis, look for, or ask the patient to point out, the bleeding area. With permission, manually move the prosthesis to attempt to stimulate bleeding and/or elicit discomfort. Evaluate the occlusion. Look for balanced pressure with freedom in centric. Ensure that there is appropriate interocclusal space. Remove the prosthesis and look for indents in the tissues (assess for overseating). Use a pressure indicator paste (PIP) to identify areas of heavy contact when passive and active. Mark the areas of soreness with a marker and relieve the prosthesis. Look for sites of thin mucosa over non-yielding areas such as tori or sharp bony ridges where a denture base may have traumatized tissues. Assess path of insertion and see if insertion/removal by the patient or caregiver may have damaged tissues. Clinically assess if the prosthesis is clean and assess the condition of the reline material, if any. Take radiographs of the area and compare with the contralateral side to assess anatomical changes. Based on localized erythema and/or edema within a relatively short period directly associated with prosthesis wear, a diagnosis of ill-fitting prosthesis can be established. If problem does not resolve or worsen despite cooperation from the patient, refer to an oral pathologist or surgeon for further evaluation. Oral pathologist: further assessment of chronic area. Biopsy and specific diagnosis of unknown etiology. If further intervention is needed, the oral pathologist will refer to either an oral surgeon or head and neck surgeon. Oral surgeon: further assessment of chronic area. Biopsy and specific diagnosis of unknown etiology. If further intervention is needed, the oral surgeon may refer to a head and neck surgeon. Document symptoms (e.g., time of day and medications taken). Discontinue prosthesis wear at night. Avoid sharp foods such as pretzels, chips, popcorn, or nuts that may worsen the symptoms. Keep a diet record until the next appointment. If medication has been prescribed, take it as instructed. If the situation worsens before the follow-up appointment, contact your dentist. [No authors listed]. The glossary of prosthodontic terms. J Prosthet Dent. 2005;94(1):10-92.